Britain's Jonnie Peacock and American rival Richard Browne have both set their sights on breaking the world record at London's Anniversary Games. 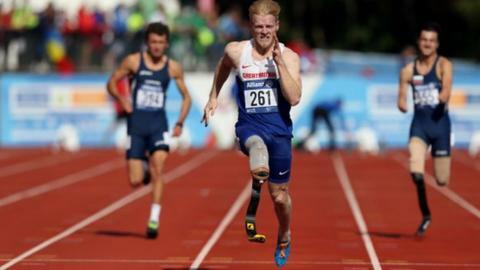 Peacock, 22, beat Browne to the T44 100m gold at the 2012 Paralympics to launch him into the public eye. The pair are set to renew their rivalry at the same Olympic Park track in east London next Sunday. Peacock said: "It's one of the fastest tracks in the country, probably the world, so it's a great opportunity. " Britain's Paralympic, world and European champion is one of four athletes who have gone under 11 seconds who will line up for the race on 26 July. Single-leg amputee sprinter Browne, 24, holds the current record of 10.75 seconds and is confident of improving his mark. He said: "I'm definitely looking forward to going back as I've got good memories. With a good wind and a good start, I think I can run faster."